Best of Adopting Other Pets < Can I have a pony? “Mom, can I have a pony?” I may have asked that question over a hundred times a hundred different ways when I was growing up. We lived in a big city but that didn’t phase me. I drew ponies, played pony games, and inspired by visits to suburban stables, created elaborate equestrian centers out of blocks with plastic horses and Barbie doll riders. When I was 10 years old we moved to the suburbs – right next to a real horseback riding academy! Fast forward a few years later, and my family adopted a retired one-eyed pony named Danny, making my pony dreams come true. (That’s him in my photo above, lowering his head so my young helper could more easily put his halter on.) 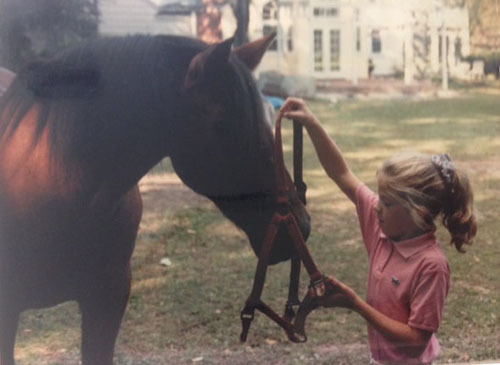 By age 12 I knew the tremendous responsibility and costs involved with properly caring for a pony, as they’d been explained to me all the years I’d been asking for a pony. If you have a child or you yourself are exploring the idea of adopting a pony or adopting a horse, here are some of the factors to consider. Are you ready for a lifetime commitment? Ponies can live 30 years or more. My one-eyed pony Danny lived to be 44 years old! A pony is expensive! Even if you keep the pony on your own property so you don’t have boarding costs, you still have to pay for vet care and shoeing, and most likely hay, feed, bedding. Plus there’s the occasional expenses of replacing items as they wear out like blankets, buckets, brushes, halter, lead rope, bridle, saddle, saddle pad, and then your own safety and riding gear like a helmet and riding boots too. Oh, and there’s upkeep of the pony’s housing (barn or run-in shed) and disposal of their manure too. Ponies need daily care. Like other animals, a pony can’t just be left in a field to fend for himself. Someone – if not you, someone you pay – needs to check on them daily or multiple times day, muck their stall or pick up manure from the pasture, fill their water, give them hay or feed. My pony Danny was my best friend when I was growing up. He was my confident, my racing buddy, and a source of great love and fun! He taught me so much about responsibility and kindness through caring for an animal. If your child asks you, “Can I have a pony?” I hope you’ll consider making their pony dreams come true! Did you like this article? See our other pony-centric articles about adopting a horse and how much does it cost to care for a horse too!